Intel has revealed its latest generation of data centre hardware at CES 2019. 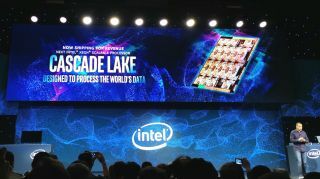 The chip giant took the wraps off its new Cascade Lake chips as it looks to show off its new 10nm architecture and improve data centre computing for users around the globe. "We’ve come to recognise that the data centre is this quiet force behind the scenes that moves and processes data, and really creates value for all of us,” said Navin Shenoy, Intel executive vice president in the Data Center Group. The new chips, described by Shenoy as being “designed to handle processing the world’s data”, offer support for up to 48-core architecture, providing a significant boost for Intel’s data centre customers. There’s also now support for Intel DL Boost, which is designed to accelerate AI deep learning inference, as well as and Intel’s Optane DC persistent memory technology, making it faster than traditional SSD hardware, however this means that apps recognise it as large memory - so can deliver data even when power is out. The launch comes as Intel celebrated 20 years of its Xeon processor, which continues to go from strength to strength, achieving 95 world records, the company says. But Intel is also looking to the future, with Shenoy also showing off the next generation of its Xeon hardware. Codenamed “Ice Lake”, the 10nm chips are compatible with the upcoming 14nm Cooper Lake processors, with Intel hoping to deliver performance improvements, new hardware-enhanced security features and more, with shipments targeted for 2020.